While strolling Dizengoff in Tel Aviv we spotted our Plushood friends, in their special, limited edition, black outfits. The pic above is of Delores in the window of a women's clothing and lifestyle store called Gusta. Then we had the pleasure of finally meeting some of our Israeli friends in person. 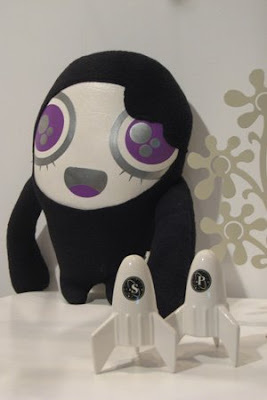 Shlomi Schillinger and Tamar Moshkovitz are the designers and creators of Plushood -- the animation series and the dolls we all know and love. 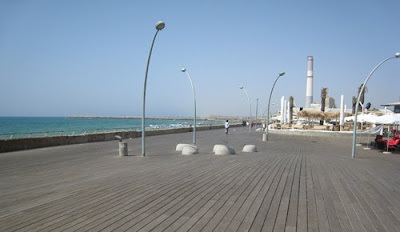 We met at the newly developed Old Tel Aviv Port which is full of shops, restaurants, and nightclubs and coolly features an undulating boardwalk! It was a very hot and sunny day -- thus the shiny squinty faces. But isn't Tamar adorable (on right)?